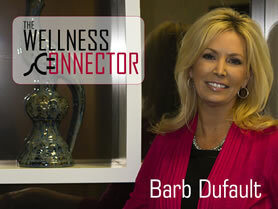 Barb Dufault, the Wellness Connector, brings you experience in the financial wellness field, and the health wellness field. As you watch this show, she introduces herself and what she’ll be bringing to her followed audience. You’ll learn the hints to great wealth, along with taxation breaks in your finances. Our Guest today, Jeannette Blawn, shows you how she made $1000 in her first month of dealing with toothpaste! Watch this incredible show and learn how whitening your teeth with toothpaste can make you money, and how you can participate and earn extra money with absolutely no start up cost or obligations. Part 2 - Guest LuAnn Casillas discusses the importance of home security and finances. As you listen to this show, you'll see that your home is truly not your security, it's your income. It's something was to happen to the head of the household, would you be able to financially sustain your lifestyle? Take Action Today. Guest LuAnn Casillas discusses the importance of home security and finances. As you listen to this show, you'll see that your home is truly not your security, it's your income. It's something was to happen to the head of the household, would you be able to financially sustain your lifestyle? Take Action Today. Water is more than merely H2O, more than the sum of chemical properties. It possesses special characteristics primarily from its special inner structure. Guest, Patrick Durkin explains if structured correctly, there are many health benefits. Suzy Farrow shares more of her God-Given dream of creating the Nature Chapel that honors the creation of earth. Here the story of how divine appointments came into place as she moves forward to making this dream a reality. Suzy Farrow shares her God-Given dream of creating the Nature Chapel that honors the creation of earth. Here the story of how divine appointments came into place as she moves forward to making this dream a reality. Sleep expert Ryan Richards of the Sleep and Wellness center describes in details, the symptoms of obstructive sleep apnea. If you have sleep issues, this should be watched. Part 2 - Guests, Dr Heather Renee and Maryjane Buenafe, teach the benefits of this molecular product that targets the root of illness. You'll educate yourself, while being amazed at these natural products, and what they can do for you, and your children. Guests, Dr Heather Renee and Maryjane Buenafe, teach the benefits of this molecular product that targets the root of illness. You'll educate yourself, while being amazed at these natural products, and what they can do for you, and your children. To learn more about product, or to contact Dr Heather Renee and Maryjane Buenafe, go to: http://TheWellnessWorld.net. Part 2 - From being an entrepreneur at an early age, to owning one of Hawaii's top coffee companies, Suzy was encouraged by Walt Disney to never give up her dreams. Watch this remarkable award winning author give her inspirational story. From being an entrepreneur at an early age, to owning one of Hawaii's top coffee companies, Suzy was encouraged by Walt Disney to never give up her dreams. Watch this remarkable award winning author give her inspirational story. Is it too early to start your children's future? Watch Karen Pena explain how you can begin now and have your children become millionaires, with the minimum of $100 per month. Leave a legacy of fortune for your children. LuAnn Casillas answers these questions: Is it ever too early to start saving for your future? Watch to see how it's very important for parents to start putting money aside immediately for your children. Have you heard of the Rule of 72? Did you know that if your bank files bankruptcy, all of your pension is out the window? A free call will get a free consultation to review your retirement. Take Action Today. From the beginning, Rain International, set out to make changes to improve the world around us starting with the health industry and moving beyond its borders into global sustainability, education initiatives, elevated lifestyles, and more. Watch and you'll want to get your body involved with these products. Going further into the Energetic Integrators and Rejuvenators, watch to see how your body can be without pain and discomfort with just a few treatments. Finally, technology is catching up to God. If you're having any health issues at all, this is a must watch. If your child is questioning their sexual identity, this is a must watch. You'll be amazed at the information you'll learn about how to keep your body's energy flowing the way God designed it to flow. You've been putting your future funds off too long? Take some action today. Watch this inspiration video that will push you into making a call to verify your future financial status. The Wellness Connector will sit with you, or Skype with you, at no charge, to see if your future is secure. Take advantage of this today - there's no harm. Watch as Barb Dufault pours her heart out with her love to see other's protected and secured. As you watch this, you'll "see" her heart. As you watch, you'll see some powerful testimonies of individuals being hit with the unexpected, and how they came through with financial wellness. If you think you're set for retirement, or set because you're too young to be hit with the unexpected - Watch This! In the top half percent of his industry, Guest Richard Conlon explains what happens to our money after we retire. Do you have adequate funds to keep you after retirement? It's no longer HOW much money you have upon retirement, it's how much money you need to live on. Watch this to make sure you have all you need when you retire. This video will explain what to do if you don't, or even if you think you do! Dr Jody Danese explains the benefits of aligning your body with the right treatments of chiropractic work, acupuncture and yoga. With over 30 years of experience, she shares some testimonies of outrageous, yet believable things that has happened to some of her patients. Looking for the right way to strengthen your body with optimal health? Jennifer Sparks introduces the Kangen Water machine that produces the correct ph balance in your water. Whether your drinking it, cooking with it, cleaning with it, it's a must to see. You'll be amazed to learn about the water your drinking, even bottled water. Barb Dufault has her children, who are in the Education Industry, as guest today. They give a wonderful explanation of where the schools and teachers are today. Get it from 3 teachers on how to encourage your children's teachers, from their point of view. Continuing the topic of Education, our guest Michael Buenafe discusses the subject of teachers in depth. The discussion leads to what teachers go through, how they can refresh themselves and become a better teacher for their students. Jeanette Blawn talks about hospice care in this show. Did you know you can request hospice care without a doctor's recommendation? Did you know there are several questions that you need to ask hospice care before they begin? Watch as Jeanette uncovers the benefits of hospice care. Continue this journey with The Wellness Connector, Barb Dufault as she walks the land wanted for the Chapel of Nature, with Suzy Farrow. Get a feel for the land, and the project as Barb and her team scott the potential land that can be purchased for the nature chapel. Go to http://chapelofnature.com to donate. How can you maximize your retirement strategies? At the same you can eliminate taxation, and save one third as much, and end up at retirement, with twice as much. Watch, and take action today. In the show today, Barb Dufault explains that grieving over a loss loved one, is a personal journey. After recently losing her mother, she finds different circumstances that pull different emotions out. Please watch if you're suffering from loss. On a summer break Dr. Yoder interned with a chiropractor who mentored Dr. Yoder on how the mind-body connection was really through the human nervous system. As he became a patient to learn this first hand he soon noticed how much healthier his own body became. Watch to learn how he met his mother on this journey of life. Part 2 - On a summer break Dr. Yoder interned with a chiropractor who mentored Dr. Yoder on how the mind-body connection was really through the human nervous system. As he became a patient to learn this first hand he soon noticed how much healthier his own body became. Watch to learn how he met his mother on this journey of life. David Cooley is a Self Development Coach that work with Christian men and women and show them how to rise above the noise and struggle of their own thoughts ...stop procrastination, silence the voice of self-doubt, and become the person they want, and need to be, to achieve the life they silently desire. Need Encouragement? Listening to Cornelia's testimony of walking away from cancer, with God's help, moving into a new state, she braved a new life. Looking back, not knowing how she'd make it, she rejoices in where she is in life. We continue this extraordinary path in part 3 with David Cooley. He is a Self Development Coach that work with Christian men and women and show them how to rise above the noise and struggle of their own thoughts ...stop procrastination, silence the voice of self-doubt, and become the person they want, and need to be, to achieve the life they silently desire. We continue this extraordinary path in part 4 with David Cooley. He is a Self Development Coach that work with Christian men and women and show them how to rise above the noise and struggle of their own thoughts ...stop procrastination, silence the voice of self-doubt, and become the person they want, and need to be, to achieve the life they silently desire. Back by popular demand, Cornelia Steinberg returns to the Wellness Connector to give more of her story of what God did in her life. Watch more encouraging words once you lean on God. Not only can you manage your stress, watching Bill Cortright, you will learn to master your stress levels. Become aware that stress is an illusion, and learn how to master it by putting these simple steps into your life. Part 1 of 3. Not only can you manage your stress, watching Bill Cortright, you will learn to master your stress levels. Become aware that stress is an illusion, and learn how to master it by putting these simple steps into your life. Part 2 of 3. Not only can you manage your stress, watching Bill Cortright, you will learn to master your stress levels. Become aware that stress is an illusion, and learn how to master it by putting these simple steps into your life. Part 3 of 3. Michael Stark considers it a privilege to help buyers find interesting deals for residential, residential income, commercial, and triple net properties in Orange County and Los Angeles County. Jennifer Ly discusses the multiple plans that you need to cover all areas of your life, from medical, to life, to retirement. Between her being a Broker, and Barb, you'll be covered for life. Barb's lifetime friend, Sheri Griffiths helps with the demonstration of the NES system. This system provides holistic energy scans of your body through NES Health Bio-Energentic Medicine. These systems help restore your energy flow so that you can heal more quickly and feel better faster. This is a topic that every American should discuss with a professional. Barb Dufault walks you through a situation of health issues and how to financially take care of your family - while you're still alive. Watch some great testimonies on this show, of living benefits. With her friend, Sheri Griffiths, Barb gives a bio energetic demonstration of AO Technology. Discover what AO Health Technology is all about. Not only are we a spiritual being, we are a human physical being with a wiring system that needs to remain aligned. Our guest today, Dan Stone, is a mortgage coach, that walks with you on the purchase of a home. Don's specialty is searching and finding you the best home loan rate, that fits your needs, not the lender's. Today guest, Nicole Rafferty goes into details about how she spent thousands of dollars going to multiple doctors. After no diagnoses, she beings to do her own research. After a successful journey, she now enjoys her health. Our guest today, Bard Dufault's own daughter, Sarah Brennan, was diagnosed with Adult ADHD. After multiple opinions of anxiety and other illnesses, finally the true diagnosis was delivered. Watch as she learns what helps and what doesn't. Today's guest, David Cooley, discuss the benefits of Living Benefits. Living Benefits is an insurance plan that allows you to withdraw money from its account, while you're still alive - at ZERO RISK OF LOSS. Listen to the testimonies of how this brought families through very tough times. Today guest, David Cooley, discuss the benefits of Biome Medic. This is a supplement that is designed to remove a toxic substance from our gut called glyphosate. This is a chemical that is used on 75% of our foods, and destroys our micro biome in our gut and damages our immune system. We have the left side of our brain, the right side of our brain, and now Dr Yoder, a Chiropractor, discusses the Heart Brain. This show goes into the depths of our emotions and feelings, and how to bring them together. Not relying on doctors, our guest today, Nicole Rafferty does her own Do-It-Yourself medical research and gives herself an accurate diagnosis. Learn more how she began her research and concluded it. I am so overwhelmed and blessed by this beautiful story of redemption and the restoration to your family!! Thank you for airing this wondrous story! ?